Shadowgate was a very popular point and click adventure from 1987 on the Apple II, Mac, PC, Amiga and ST, and was released later in 1989 on the NES. Contributor Luca Bertoldi however found that a C64 version was on the cards too – thanks to a Mindscape catalogue advert. 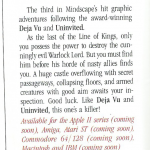 And we don’t believe it is a red herring, as the developer ICOM Simulations have had C64 titles released, including Deja Vu and Uninvited from that same era (which are also mentioned in the advert as some of their titles). So what happened exactly? We’re not quite sure just yet. The C64 was still popular in the US at the time, so it seems odd that Shadowgate was cancelled. We believe that the game was very likely to have been in production by Fred Allen & Joe Gaucher – who did Deja Vu (and likely Uninvited too). So the hunt begins! Can you help us recover the C64 version of this classic game? Perhaps there’s a way to track down who uploaded that, to ask why they put “Commodore 64” in the title? Ah, I completely missed the title!! I suspect it is a mistake, but i’ll check!